The story of aviation is man’s great struggle to conquer the air as he has the land and sea over the centuries. In the past century his quest to touch new horizons – to become a part of infinite space – has brought about the design and manufacture of larger and more powerful airplanes reaching greater altitudes, reducing time, and riding with increased dependability and safety in flight.Of prime importance to the growth of aviation was the development of Hamilton Standard Propellers. Over the years they have been out in front as a consistent leader in the aircraft industry. Almost from the airplane’s birth, through its barn-storming infancy, commercial growth, and its rapid maturity in World War II, Hamilton Standard propellers and their forerunners have been the most widely used piece of aircraft equipment.Today, propellers are a far cry from the early, hand-fashioned wooden propeller blocks bolted to engine shafts. They are precision instruments carefully machined to fine tolerances, containing hundreds of delicately balanced parts. Without their flexibility, the range, speed and scope of the present sky giants would not be possible. Years of engineering development and refinement, as well as skill and craftsmanship in manufacturing, have fostered a reputation for dependability and service life that is recognized the world over.Rooted deep in the conquest of the air were Hamilton Standard Propellers flying on throbbing bombers, scheduled transports, roaring fighters and gliding sport planes – flying WHEREVER MAN FLIES. Flying the skies in 1929 were 134 approved propeller types, 80% of which were Hamilton Standard. Established in a modern, spacious factory at West Homestead, Pennsylvania, the new subsidiary of United Aircraft Corporation was manufacturing the adjustable propeller – the culmination of twenty years of research and development in propeller design. Its wide popularity in the young aviation world was based on the all-metal construction, duraluminum blade and the then radical feature of blade adjustment. Considerably lighter than its immediate predecessor of hollow steel and more durable than wood, the Adjustable became known for its dependability – a major factor in the conquest of the air. By the use of a two-piece steel hub, the blades could be adjusted on the ground to any angle to improve operation and increase aerodynamic efficiency. Dependable, light, efficient, flexible, the Adjustable flew Frank Hawks in 1930 when he broke countless speed records in his “Mystery S,” carried Post and Gatty’s “Winnie Mae” safely on its record-breaking 8¼ day world flight, breezed the country with Jimmy Doolittle for the 1931 Bendix Trophy – to name only a few aviation headliners. It was selected by the pioneers in aviation seeking to perfect a new mode of transportation. Behind this achievement in propeller design, however, was the eleven years research of Standard Steel PropellerCompany and the twenty years experience of Hamilton Aero Manufacturing Company – the ancestors of Hamilton Standard. Standard Steel long had worked to improve all-metal propellers and to perfect adjustability. In 1918, the first hollow-steel, fixed-pitch design was produced, supplanting the heavy and expensive solid steel propeller being tested at the time. Encouraged by the Army, the Company by 1921 had developed a propeller with detachable, drop-forged solid dura-aluminum blades locked by a screw and wedge adjustment in the steel hub. But Standard Steel’s engineers, under the leadership of Thomas A. Dicks, recognized the extreme value of adjustability and developed the split-steel hub, which made the change of blade pitch on the ground completely practical. The high performance of airplanes equipped with metal propeller in the Pulitzer Trophy and Schneider Cup races of 1923 demonstrated the superiority of metal over wood, but it took the follow years to prove the soundness of Standard’s design. Remember some of the companies who planes climbed into the air in the last years of the ‘20s – Travelair, Pitcairn, Wright, Martin, Curtiss, Boeing, Douglas, Fokker, Ryan, Loening, Consolidated, Ford-Stout. Recall some of the men who extended aviation’s horizons – Charles Lindbergh in his “Spirit of St. Louis” across the Atlantic, Sir Hubert Wilkins to the Arctic and Antarctic, Commander Richard E. Byrd and his South Pole Expedition, Sir Charles Kingsford-Smith with the “Southern Cross” to Australia, George Haldeman and Ruth Elder setting a new world endurance record of approximately 39 hours, C. C. Champion’s altitude record of 38,418 feet and Chance Vought’s first Corsair with four world’s records in five weeks. Within two years, there was hardly and Army, Navy, mail or passenger plane flying in the high and medium horsepower class without a Standard Steel, all-metal adjustable-pitch propeller. Back in 1909, only six years after Orville Wright soared into the sky for 12 seconds at Kitty Hawk, Thomas F. Hamilton had set up shop in Seattle, Washington – one of the first firms to make “Gliders and Aeroplanes for the market.” When the United States entered World War I in 1917, Hamilton offered his services as an aviator but found that the Army and Navy were more interested in his ability to make propellers. They told him to get a factory and build all he could. Following the war, Hamilton’s propellers inaugurated the first continuous, scheduled air mail flight from Washington, D.C. to New York with a Curtiss “Jenny” JN-4, and in the next year (1919) led Lt. Commader. Albert C. Read’s famous flight across the Atlantic in the NC-4. Metal-sheathed wooden propellers built by Hamtilton Aero of Milwaukee were used by the Army in 1924 on its Douglas World Cruisers, “Chicago” and “New Orleans” – first to fly the globe. First over the Atlantic, first around the world, Hamilton’s propellers attained an even more important position in aviation when they achieved over 17,000 miles of dependable flight with Commander Byrd’s Fokker monoplane, “Josephine Ford” – a service record in the infant days of air travel. The All-American Aircraft Show of 1928 at Detroit exhibited 57 private planes. Twenty-nine were equipped with Hamilton Aero Propellers. More manufacturers of small planes were using this design than all other types combined. Hamilton’s contribution to aviation lay in the twenty years of studying wood and steel propeller designs for engines of 50 to 400 horsepower, and in manufacturing approximately 30 different models for the Fairchild, Bellanca, Cessna, Ryan, Stearman, Waco, Stinson, Lockheed, and other famed planes of the day. When in 1929 Hamilton Aero merged with Standard Steel to become a subsidiary of United Aircraft and Transport Corporation, it was the oldest, unchanged name in commercial aeronautics. Though the flood of races, flights, tours and records continually added to the fame of the Adjustable propeller, engineers fully realized that, if aviation were to reach out further into space and give men efficient and more dependable transportation, a propeller had to be designed that would act as a gear shift in the air. Heavily loaded Boeing Monomail planes on the Chicago-San Francisco run of Boeing Air Transport struggled to get off the mile high fields of Cheyenne and Rock Springs; and bulging flying boats labored to get off the water. Both found that in flight the power of their engines could only partially be used. The blades of the Adjustable had to be set at an angle that would afford the best compromise between the requirement of takeoff and climb and the high pitch necessary for economical cruising. Such a compromise naturally was unsatisfactory for maximum engine output in either condition. In takeoff, the engine was incapable of turning up its full rated horsepower with the blades not set in full low pitch; and in similar fashion, the engine would race in level flight for lack of sufficient blade pitch to absorb its power. It was like driving a car locked in second gear. The engine would strain in starting, would waste gas and be inefficient on the open road, because the full power of the engine could not be utilized. Aircraft were growing in size and load carrying possibilities. Engines were being manufactured that developed greater horsepower. Propeller controllability was a must to the growth of aviation. Early in 1930, after thorough research and refinement, Hamilton Standard introduced to the aviation world the first practical propeller whose blade pitch could be controlled by the pilot. The device was simple and rugged. To get takeoff power, the pilot shifted a lever in the cockpit. A piston attached to the propeller and operated by oil pressure from the engine, twisted the blades to low pitch and the propeller revolved rapidly taking small bites of air. When altitude was acquired and the pilot was ready for cruising, he released the lever in the cockpit and the blades were automatically pulled into high pitch by the centrifugal force on two counterweights attached to the hub and blades. Controllables were in the air wherever man flew – over the Pacific with Pangborn and Herndon; with the record-breaking, 13 hours, cross-country fight of Eddie Rickenbacker and Jack Frye in their DC-2; with the Lindberghs on their Alaskan survey and world flight. Worldwide reputation followed, climaxed by the licensing of DeHavilland Ltd., in England and manufacturers in five other countries. Typical of their imagination, foresight, and soundness of engineering principles was the realization by Caldwell and his associates that the day would come when automatic control of blade pitch would replace manual control. Engines with a given load have a certain speed at which they are most efficient. It was necessary, therefore, to develop a propeller that would automatically change its blade pitch to meet various flight conditions. No matter how fast a plane is flying or whether it is cruising, climbing, or diving, the propeller should be able to adjust its pitch to whatever angle is necessary to obtain the maximum forward thrust, and at the same time, permit the engine to deliver its specified power. Late in 1935, Hamilton Standard in collaboration with the experienced Woodward Governor Company, designed and added a simple, constant speed control mechanism which eliminated manual control and metered the flow of engine oil to and from the propeller, adjusting blade pitch to give maximum engine efficiency under all conditions. Here, then, was an automatic gearshift of the air in operation only five years after controllability was first put into service. Paced by Pan American and United, the airlines immediately installed them on their Douglas DC-2’s, Sikorsky Transports and Clippers, Lockheed Vegas and Orions, Boeing 247’s, Fokker Transports and Curtiss Condors, Ford Trimotors, Fairchilds, Junkers, Northrops, Vultees, and Consolidateds pioneering the airplanes of the world. The army used them on its Boeing 299, father of the “Flying Fortress”, and the Navy adopted them for its Consolidated PBY, long range patrol boats. Racers and private planes alike turned to the Constant Speed propeller, and Hamilton Standard in 1936 was forced to expand its manufacturing facilities to meet the demands of the young aviation world requiring 2500 propellers a year. Leading the airlines in their period of early growth, and flying with the military’s high performance combat planes, the Controllable-Counterweight and Constant Speed propellers pushed back the sky’s frontier and gave man greater confidence in flight. On Wednesday, April 6th, 1938, casual, spring strollers in New York’s Central Park heard the throb of an airliner and looked to the skies to see a 21 passenger, twin-engine plane flying calmly with only one propeller in operation; the other, motionless in flight. Incredible? No, just a demonstration of a feathered propeller – the result of three years of engineering research to bring still more dependable flight to planes and passengers, and to save an inoperative engine from further damage. Ten years before, blade pitch was adjustable only on the ground. In 1930, the pilot manually controlled the pitch of his propeller blades. On this eventful day, a bottom was pressed in the cockpit, and the blades became parallel to the line of flight, acting as powerful brakes to the engine, eliminating the drag of windmilling and thus providing safer and easier control of the plane in an emergency. Using the well-tested hydraulic principles of the world-famous Constant Speed propeller, the Hydromatic, simple and accurate in operation, embodied as well a more rapid rate of pitch change for constant speed operation. The Hydromatic seemed destined for success even before it was sold generally, for it contributed to another sensational Hughes’ flight in December 1938, when he circled the globe with two of them on his Lockheed 14 in 3 days and 19 hours. So well designed was this new propeller and so easy to operate, it has been unnecessary to revise any of its fundamental features since it was first produced. The domestic and foreign commercial airlines were quick to recognize the great value in the features of the Hydromatic and began the changeover. Just as in 1935 they had turned from two position Controllable-Counterweights to Constant Speed propellers, so they now replaced the latter with Hydromatics. Douglas DC-2’s, DC-3’s, Boeing 247’s, Stratoliners and clippers, Sikorsky Flying Boats, Martin Clippers, Lockheed 12’s, 14’s and Lodestars, bearing the insignias of the 21 great airlines, crisscrossed the air lanes of our country, the Atlantic and Pacific, all equipped with Hydromatics. The airline record for 1939 speaks for itself. Within two years the airline safety record had tripled – over 41 million miles flown per fatal accident, over 1,850,000 passengers a year, an increase of 70%; and cargo shipments up 33% to 9,500,000 pounds. Quick-feathering Hydromatics were a part of that great safety record. More accurate constant speed fostered greater economical flight. And, today, many of those early Hydromatics still ride the world’s airways packed with the experience of 12,000-15,000 hours – over 2,000,000 miles of safe and dependable flight. As a result of this experience, limits on the service life expectance of Hydromatics have been removed. At this time another major development of considerable importance was finally perfected by the Company after years of refinement – the discovery of a method of measuring propeller vibration stresses in flight. Carbon strips attached to the blade or hub recorded the stresses electrically on oscillograph records and revealed exactly the magnitude and character of the stresses. Blades no longer had to be built with extra metal at all points as a precaution against failure. Improved knowledge of stresses meant thinner, lighter, and stronger blade, giving still more economical and dependable flight. Blade failure from vibration stresses was virtually eliminated, and Hamilton Standard, proud of its discovery, offered it to the entire aviation industry. This method of determining vibration stresses has since been made a requirement of the Civil Aeronautics Administration and the Army and Navy air forces. From the inception of the Company, it has been its responsibility to be prepared for war emergency by having superior propellers available for manufacture and the ability to put them quickly into quantity production. In spite of many obstacles, the Company had carried on the development of its product over the years and had enriched it with a vast service experience through widespread use by the military and commercial aviation world. Fortunately for the growing military air forces, the Hydromatic had been engineered, proved and placed in production in time to equip the greater part of first line warplanes. Convinced that the war clouds in Europe were gathering rapidly, and that there would be further heavy demands for its equipment, Hamilton Standard started expansion of it facilities early in 1939. At is own expense, the Company moved to a larger plant, increased its manufacturing area over 50% to a total of 220,000 square feet, and set up four propeller test houses to accommodate propellers up to twenty feet in diameter. Later that spring, after contracts had been received from Europe, Hydromatics were shipped to a France destitute of propeller equipment, and later to an England fully cognizant of the fact that there was no longer “peace in our time.” And still later – in those black, summer days of 1940, when England saw death riding her skies and the civilized world hung breathless on her fate, British-built Hamilton Standard propellers were on the small band of Spitfires and Hurricanes that outflew and outfought the German Luftwaffe.After General H.H. Arnold had expressed concern over anticipated emergency propeller requirement, Hamilton Standard again expanded its factory area another 30,000 square feet so that 2200 employees could turn out 1200 propellers per month. Dunkerque came. Paris fell. President Roosevelt called for 50,000 planes and by December 1940, Hamilton Standard nearly tripled its 1939 production and doubled the number of employees on the production front. This was only the beginning. Careful study of the situation indicated that radical steps would have to be taken to cope with the mass production of a precision instrument that had to be manufactured to such find tolerances. Four methods were adopted: 1. Increased factory output. – 2. Extensive subcontracting. – 3. Satellite plants. – 4. Licensing other manufacturers. Their successful application is one of the bright pages in the story of American aircraft in this war. First, three working shifts, twenty-four hours a day, seven days a week – all out production. Special, single-purpose, automatic, accurate machine tools were introduced to a large extent – broaching machines to replace millers, multiple spindle boring and turning machines with push button controls to replace lathes and drill presses, the installation on conveyors and complete utilization of floor space. This permitted the employment of women and semi-skilled personnel who could be trained in the plant. Because of this simplification, the unskilled worker in 1944 produced over twice the output of 1938, and Washington officials termed the East Hartford plant, “the biggest little factory in the world”. But such a production rate could not have been met without the extension of subcontracting and the splendid cooperation of Hamilton Standard’s subcontractors. These firms had been selected not alone for their experience and reputation, but as well for their excellent organization, supervision and manpower. First cam the pilot orders to iron out the innumerable problems connected with the manufacture of parts for such a precision instrument. Then, with aptitude clearly demonstrated, contracts were let to supplement Hamilton Standard’s own production or replace it altogether. STILL NOT ENOUGH! Hamilton Standard turned to the “shadow plant” plant and established three satellite plants in abandoned New England textile mills. This avoided the construction of new building that would have taken time, money, crucial material and at the same time was accomplished in areas where available manpower could be utilized. The Westerly Plant, leased in October, 1940 and opened three months later, was shipping more an 1,500 propellers a month in one year. April 1942 saw the Norwich plant leased and dedicated to the manufacture of Controllable-Counterweight Propellers for all the light transport planes, basic and advanced trainers and scouts so urgently needed for the training of American pilots. Over 38,000 had been shipped to the training fields of America by V-J Day. Just a year before, Canadian Propellers, Ltd., a licensee in Montreal, Canada, had started manufacturing two-bladed Hamilton Standard Counterweight Propellers chiefly for North American Texans and Noorduyn Harvards, shipping more than 10,000 by October 1944. And still another plant was established in what had been the largest silk weaving shed in the world at Darlington, Rhode Island. The home plant and its satellites operated as a integral unit under a single, close managerial control, each making parts for itself and each other. STILL NOT ENOUGH to flail the skies of the Axis! Early in 1941, Hamilton Standard had proposed to the government that other competent manufacturers be licensed to make complete propellers, so that trained managerial staff and experienced labor personnel of mass producing, consumer industries could turn out the stable, large run propellers and thus relieve part of the load on the parent company. 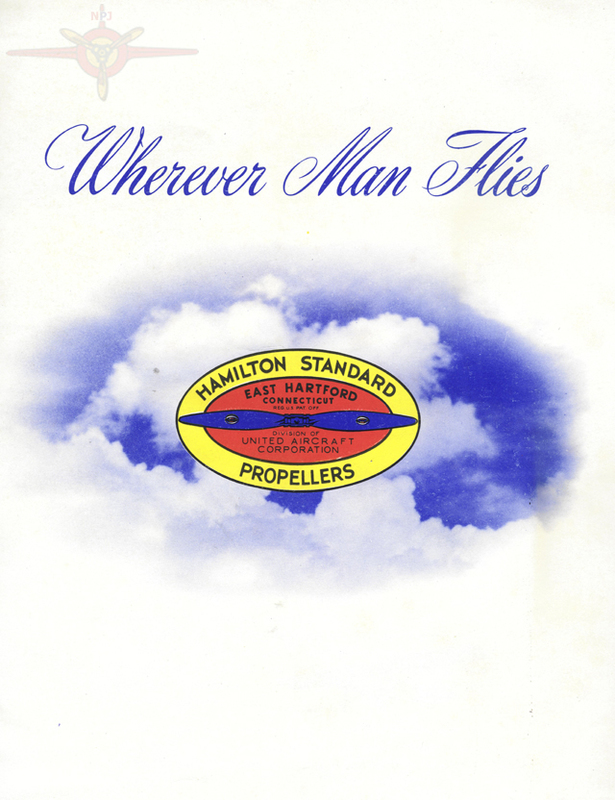 While these companies were engaged in the task of converting from the manufacture of automobile, refrigerators and office equipment, Hamilton Standard added to its already-burdened program thousands of man-hours in training their personnel, carrying the heavy load of additional engineering involved, and equipping itself to service all licensee propellers. When Germany invaded Russia, Nash-Kelvinator created a propeller division and within 10 months had shipped its first propeller. By August, 1945, it had sent to the fighting fronts 155,000 Hydromatic Propellers for Flying Fortresses, Liberators, Mitchells, Havocs, Catalina, Skytrains, British Lancasters and Mosquitos. Just before Bataan surrendered, Frigidaire, Division of General Motors, turned from refrigerators to three-bladed Hydromatics for the Flying Fortresses and Liberators and later to four-bladed Hydromatics for the massive B-29 Superfortresses. The Company celebrated V-J Day with the accomplishment of over 75,000 propellers fighting the enemy. Reminton-Rand, in May 1942, started equipping the Skytrains, Mitchells, Invaders, Skymasters, Vengeances, Havocs and Fortresses with Hydromatics that totaled more than 62,000 in three years. War had turned Hamilton Standard and its licensees into a mass production facility for the Army and Navy, but the Company never lost the soundness of engineering technique or precision manufacture which established it reputation for dependability in the aviation world. The close of 1943 saw the 1,000,000th blade of the controllable type on its way to war, and within twenty months the 2,000,000th blade had been completed. Fighting uphill toward its production peak, the Company and its licensees had stretched the factory front and number of war workers 17 times and had outfought the enemy’s production line by increasing the monthly rate 60 times within four years. 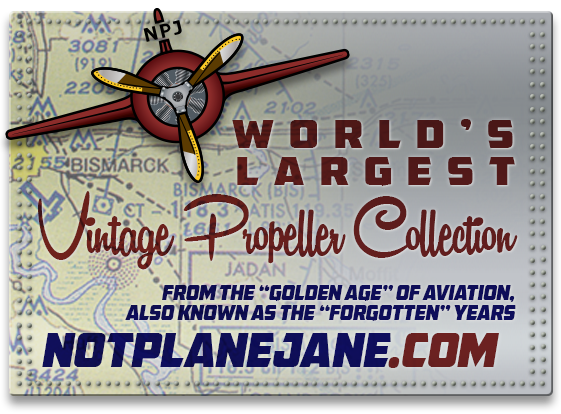 From those early days of 1939, Hamilton Standard’s propeller output accelerated to a position unparalleled in history, keeping pace with the vast expansion of the aircraft industry as a whole which turned the tactics of Blitzkrieg back on the inventor. However, for the two years that immediately followed the outbreak of war, the burden of our country’s production for defense rested in the hands of those whose vision and courage had accepted the responsibility of having superior equipment always available. For this reason, bombers on timetable schedules were able to break the enemy’s war-making industries, oil refiners, and modes of transportation’ superior fighting planes were able to fight across the wastes of Africa and the Pacific, the rich fields of Italy and Germany and the tangled jungles of the Orient to the enemy’s inner sanctum. But this is the destructive conquest of the enemy’s air to conquer aggression, not the conquest of the air to allow man to become a part of infinite space and fashion one world of peaceful enterprise. Over the past four years, in the wake of the horrors of chaos, global airways have developed under the wings of the Army Air Transport Command and Naval Air Transport Service. Born of the vital need to rush war material to far-flung battlefronts at the time of greatest emergency, the ATC and NATS had taken form with the cooperation of the domestic airlines who, in 1942, had divested themselves of half their planes, pooled their resources, manpower and technology. Three years later, every half hour of every day, planes of the ATC and NATS flew approximately 25,000 miles – the distance around the world at the equator – or more than 34,000,000 miles a month. Domestic airline officials point out that these military air transport operations have resulted in a priceless accumulation of operating experience and technical improvements which have advanced the art of air transportation by as much as twenty-five years. Here was a network of 240,000 route miles extending from the United States across the seven seas to all continents – shuttling over the Atlantic at twenty minute intervals, pebble-skipping the islands of the Pacific every minute of the day and night east over Iran’s plains, above India’s vast millions, ferrying 40,000 tons of cargo and 145,000 passengers a month, and returning home with the wounded, the veterans and emergency supplies – mica from India, rubber seeds from Liberia, tin, mercury, tungsten from China’ industrial diamonds from South Africa. 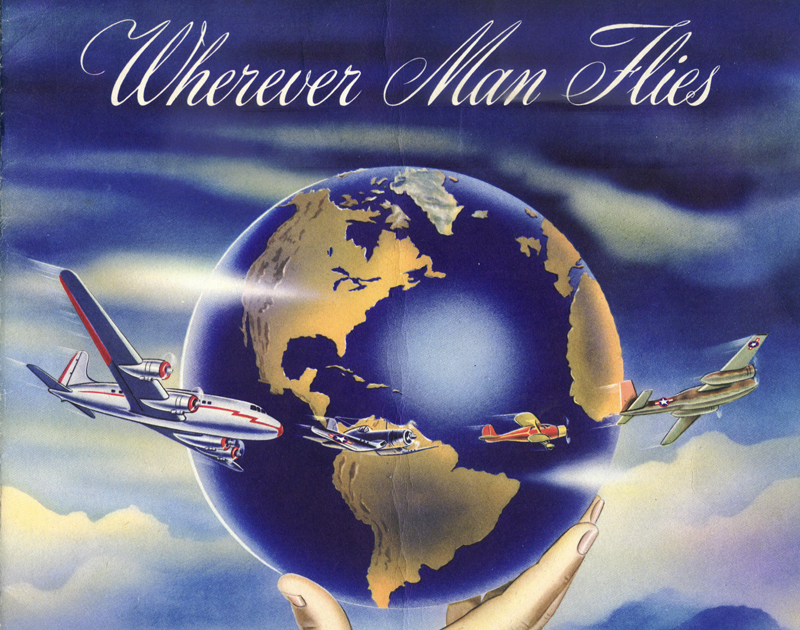 With planes originally designed for peaceful operations, the ATC and NATS carried the goods for man’s survival to the far corners of the globe. Silvered airliners like the DC-3’s, DC-2’s, Lodestars, Stratoliners and Clippers changed their colors to Army and Navy camouflage, flew as Skytrains, Skytroopers, C-60’s, C-75’s, C-98’s. Douglas Skymasters, Consolidated Coronados, Liberator Expresses, Curtiss Commandos and Martin Mariners soon joined these pioneers of global flight. A vast majority of these flew with Hydromatics because of their long service life and proved dependability. During WW II, more than 75 percent of the country’s advanced trainers, warplanes and transports were equipped with propellers of Hamilton Standard design. With its preparedness in superior equipment and ability to contribute quantity production, the Company thus discharges its duties and contributed its part in bringing the war to a victorious conclusion. Today, aviation stands on the threshold of maturity. Man has conquered the air beyond his fondest dreams and has brought about a new era of transportation that was vastly accelerated by the demands of WW II. Even before WW II had shattered peaceful enterprise, aircraft engineers had blueprinted the planes of tomorrow – air flivvers, sectional feeder-liners, flying box card and sky giants of the stratosphere - to fill the needs of man under all conditions. America’s flag airlines had seen their new destiny and were spinning an aerial web over the globe to provide courteous, comfortable, low cost transportation. Hamilton Standard’s long experience in propeller design has been instrumental in furthering these technological advances of the aircraft industry. The Company’s heritage of sound engineering research, development and precision manufacture that produced the Adjustable, the Controllable-Counterweight, the Constant Speed and Hydromatic, was being utilized to unfold new designs of propulsion. These offered the planes of today greater performance, economy of operation, long service life and above all - DEPENDABILITY, WHEREVER MAN FLIES. Hamilton Standard traces its roots back to the 1919 founding of the Standard Steel propeller Company in Pittsburgh, PA and Thomas F. Hamilton’s founding the same year of his Hamilton Aero Manufacturing Company in Milwaukee, Wisconsin. Flying in the skies in 1929, 80% of the propellers were Hamilton Standard. Established in a modern, spacious factory at West Homestead, PA, the new subsidiary of United Aircraft Corporation was manufacturing the adjustable propeller - the culmination of twenty years of research and development in propeller design. Its wide popularity in the young aviation world was based on the all-metal construction, duraluminum blade and the then radical feature of blade adjustment. Considerably lighter than its immediate predecessor of hollowed steel and more durable than wood, the "Adjustable" became know for its dependability - a major factor in the conquest of the air. By the use of the two piece steel hub, the blades could be manually adjusted on the ground to any angle to improve operation and increase aerodynamic efficiency. Dependable, light, efficient, flexible, the "Adjustable" flew Frank Hawks in 1930 when be broke countless speed records in his "Mystery Ship", carried Post and Gatty's "Winnie Mae" safely on its record breaking 8 1/4 day world flight, breezed the country with Jimmy Doolittle for the 1931 Bendix trophy - to name only a few aviation headliners. It was selected by the pioneers in aviation seeking to perfect a new mode of transportation. Behind this achievement in propeller design, however, was the eleven years research of Standard Steel Propeller Company and the twenty year experience of Hamilton Aero Manufacturing Company - the ancestor of Hamilton Standard.